It has not been easy to capture landscape level grazing parameters through participatory assessment and monitoring of rangeland quality. Disagreements exist on what indicators to use and how the generated data can be linked to management-related information and whether the methods can be replicated across different grazing areas. Rangeland quality assessment and monitoring has hence focused on conventional scientific methods while the role of indigenous ecological knowledge of local herders has been given less emphasis. This study explored Borana herders’ knowledge of assessing and monitoring rangeland quality at landscape level in Marsabit Central District in northern Kenya. A number of participatory methods have been used, including focused group discussion, key informant interviews and a joint field survey. We established that Borana herders have a considerable ecological knowledge which focuses on livestock-based indicators at the level of classified landscapes. The herders’ personal experiences and social memory further provided an environmental history of grazing landscapes and their perceptions of rangeland quality change. The herders’ knowledge can be integrated with conventional ecological methods to assess and monitor rangeland quality. Changes in range quality in terms of loss of vegetation diversity and cover have continued to attract research in the African communal rangelands (Vetter et al. 2006). The change has often been associated with intensive livestock grazing (Darkoh 2002; Rodriguez 2003; Bowman 2002) and shifts in land use from livestock grazing to crop farming and settlements. The latter not only reduces vegetation cover and diversity but also disrupts seasonal livestock movement necessary for opportunistic exploitation of spatially and temporally distributed rangeland resources (Byakagaba 2005). The assessment and monitoring of the changes in rangeland quality with the objective of capturing landscape level dynamics has not been successful using conventional scientific methods alone. This is simply because the methods are not participatory and excludes perceptions and experiences of local herders who have detailed knowledge of changes in fodder plants at landscape scale (Roba and Oba 2009a). We argue that participatory rangeland quality assessment and monitoring, integrating indigenous ecological knowledge of local resource users with conventional scientific approaches, is a most appropriate method. Assessing and monitoring rangeland quality has been constrained by a lack of understanding of appropriate indicators used by pastoral herders (Yoccoz et al. 2001) and the perception that the knowledge is locally specific, qualitative and lacks impartiality (Oba and Kaitira 2006). However, pastoral herders have been known to have considerable knowledge of rangeland quality (Peden 2005; Mauro and Hardison 2000; Berkes 1999). Herders use assessment and monitoring indicators based on landscape level processes (Mapinduzi et al. 2003; Fernandez-Gimenez 2000; Oba et al. 2000). Herders’ assessments and monitoring of rangeland quality at landscape level considers ecological variability (Niamir-Fuller and Turner 1999; Scoones 1999) which reflects spatial and temporal variation in the distribution and productivity of indigenous vegetation (Scholes and Archer 1997; Boeken and Shachak 1994; Byakagaba 2005). The ecological variability, which is described by herders mainly in terms of micro-climate, soils, and topography, generally forms the basis of their landscape classification for landscape level rangeland quality assessment and monitoring (Oba and Kaitira 2006). Pastoral herders’ landscape level knowledge of rangeland quality is built upon their observations of relationships between vegetation and livestock (Bollig and Schulte 1999; Reed and Dougill 2002). Desirable forage plant species which are normally palatable to livestock are usually used by herders as indicators of favourable rangeland quality, while undesirable plants indicate degradation (Mapinduzi et al. 2003). Herders recognise all the desirable and undesirable plant species by local names (Gemedo-Dalle et al. 2005) and they monitor changes in their plant species composition over time, based on historical knowledge (Oba and Kaitira 2006). Low livestock productivity is attributed by herders to changes in rangeland vegetation composition from desirable to undesirable forage plants, which they assess and monitor at landscape level. Herders associate each grazing landscape with particular fodder species. How do Borana herders classify grazing landscapes? What indicators are used by Borana herders to assess and monitor landscape level vegetation changes? The study was conducted in the Central Division of Marsabit Central District, Kenya, located between 01°15′ North and 04°27′ North and longitudes 36°03′ East and 38°59′ East (Warui and Nduma 2001). The study site is located along a topographical gradient from the highlands of Mount Marsabit towards the transitional zone between the mountain landscapes and arid plains, 5–6 km out of Marsabit town in a north westerly direction. The site stretches from an elevation of about 1300 m above sea level in the upper part of Mount Marsabit and slopes gently into open woodland or savannah at the foot of the mountain to an estimated elevation of 800 m above sea level. Annually rainfall ranges from 500 to 1000 mm and is distributed bio-modally between March–April and October–December (Bulle et al. 2010). The area is inhabited by diverse ethnic groups including Borana, Rendille Gabra and Burji. Agro-pastoralism is the dominant livelihood where livestock such as cattle, goats, donkeys and camels are kept in a semi-sedentary pastoral system combined with crop cultivation in the humid zone of Mount Marsabit. Farming is rain-fed with common crops including maize, beans, wheat, sorghum, millet, teff and cowpeas grown on a small scale mainly for subsistence. Semi-sedentary pastoralism coupled with the reduction of grazing areas by encroachment of farming and settlement areas have created pressure on rangeland vegetation, leading to deterioration in some areas (Shibia 2010). Focus group discussions on indigenous knowledge of rangeland quality assessment and monitoring were held with 12 key herders selected from different villages. Discussions were guided by open-ended questions. The researchers asked questions regarding knowledge of landscape characterisation, concepts of landscape assessment and monitoring, and perceptions of change in landscape quality, with sufficient time given for the responses. Discussions were followed by selection of knowledgeable herders who were asked to survey range areas jointly with the research ecologists, using the discussed concepts. The criteria used to select herders were age and experience of livestock herding in the study area. During the survey, landscape units were identified and described, using traditional indicators provided by herders. The environmental histories of the assessed landscapes were established using key informants’ knowledge. In-depth, semi-structured interviews were held with ten key informants on their knowledge of environmental history of the grazing landscapes and their perceptions of rangeland quality change. All the key informants interviewed were elders who were either born or had lived in the study area for over 30 years and were therefore knowledgeable about environmental changes. Community historical events and traditional system of counting years were used to enable herders’ recall of environmental changes. These were evaluated using social memory. Referring to the traditional Borana gadaa system (Legesse 1973), key informants were requested to narrate environmental changes during certain period of the gada. Representative areas of each landscape unit were then assessed for rangeland quality, using herders’ indicators. To facilitate the quantification of forage plants which were used by the herders as one of the indicators for rangeland quality, nested plots (1 × 1 m for herbaceous species, 4 × 4 m for shrubs and 10 × 10 m for trees) were placed at 40-m intervals along 240-m long-transects (Mapinduzi et al. 2003). Three to four transects were placed on each assessed landscape to cover a sufficient area. Herders identified forage plants and assessed livestock preference and availability trend of forage plants on each nested plot along transects. Forage plants were categorised as ‘decreasing’, ‘increasing’ and ‘stable’, based on the availability trend over the years as perceived by herders. The herders’ narratives were used to describe the knowledge of landscape classification and changes in rangeland quality. The historical environmental changes were qualitatively analysed from elders’ narratives for common environmental phenomena. Plant frequency data were used to determine the composition of plant species preferred by cattle, camels and goats and their trend over the years at each landscape. The differences in the composition of ‘decreasing’, ‘increasing’ and ‘stable’ forages on surveyed landscapes and their variations with livestock preference were analysed using Analysis of Variance and significance differences accepted at P < 0.05. Herders categorised the study area into two macro landscapes, namely, Badhaa and Gamoji, which had contrasting microclimates. The Badhaa macro landscape represents the cool sub-humid uplands, characterised by red volcanic soil and high tree canopy cover. The Gamoji represents the warm lowlands, with dark to grey soils and covered mainly with lower scrub vegetation. The two macro landscapes are used in different seasons and allow spatial distribution of grazing pressure. Badhaa is used as dry season grazing while Gamoji is used for wet season grazing. The macro landscapes were further divided into micro landscapes based upon diverse environmental indicators such as topography, soil and dominant vegetation (Table 1). The naming of micro landscapes reflected the criteria used in classification and availability of daily grazing resources. Hilly topography surrounded by farms and settlements. Mostly used reserved as calf and weak animals pasture (kallo). The soil is dominantly sandy loam. Mostly covered with shrub vegetation predominate by Maytenus sp. A historical timeline of the traditional gada system was used to capture historical environment changes that relate to vegetation. Key informants were able to remember the major environment changes using the gada periods and narrated the changes at macro landscape scale. The two macro landscape units of Badha and Gamoji therefore formed the basic unit for environment narration (Table 2). Productivity of the landscape for perennial grasses and other forage plants declined while invasive plants species such as D. eremophilum and A. mossambicensis were seen to be increasing while preferred grasses declined. Commercial exploitation of woody plant species such as Terminalia sp. for construction started in addition to charcoal burning. Droughts occurrence becomes frequent and crop failures were experienced quite often. Few farmers started shifting to miraa farming. Charcoal burning continued targeting ecologically important tree species such as Acacia species. "There were tall grasses in most of the current farming or settlement areas which we use to play hide and seek game…., we sometimes used to spot buffaloes in those grasses." "We were encouraged by colonial government to take up land and start farming, but we did not have any interest then because we had adequate number of animals which were producing enough milk. The few who started farming had also substantial harvests which sometimes rotted in the fields due to continuous rains." The informants recalled the Gamoji landscape as grassland interspersed with woody plants, grazed mostly during wet season. They narrated that due to the invasion of farming and settlements in most grazing areas of the Badha landscape, livestock now are continuously grazed on the Gamoji landscape. An elder explained this situation further. "Our livestock these days trek to Badha landscape for watering purpose only and return immediately to constantly graze Gamoji landscapes since there is no land left for grazing on the Badha landscape. The few areas left are either enclosed or overgrazed." "We normally do not see a lot of Sarima ( Duosperma eremophilum ) and Aatha ( Aspilia mossambicensis ) in most of these areas but now they are everywhere and important cattle grasses such as Maatgudeesa ( Cenchrus ciliaris ) and Allaloo ( Chrysopogon plumulosus ) are hardly seen even during the rains,…. The invasive species are good for camels but even camels are now increasingly reared on Badha landscapes and feed on Anno ( Euphorbia tirucalli ) which were planted to fence farms." "In the past, our community had no households involved in charcoal burning, but after the major drought that occurred in the gada period of Jillo Aga Adi (locally referred as the drought of solar eclipse which occurred in 1973), many pastoralists became destitute and were settled on schemes. The settled pastoralists started charcoal burning as a livelihood strategy. They cut down the trees which are important forage plants for goats and camels. …. In recent years they have also started commercial logging of Qoroobbo ( Terminalia sp.) for house construction and this species has nearly disappeared." The changes had adversely affected the productivity performances of livestock. From the herders’ assessments, the availability of desirable forages indicates good rangeland quality while availability of undesirable forages indicates poor quality. The herders categorised forage plants into desirability classes (i.e. ‘very desirable’, ‘desirable’, ‘partly desirable’, ‘undesirable’) based on livestock preferences (Table 3). The ‘very desirable’ forages are highly selected by livestock and given preference during grazing. The livestock shift down the desirability scale (from very desirable to least desirable) as the range conditions deteriorate. During the dry season when the most desirable species were over-utilised, the livestock tended to be less selective in their feeding habits. VD, very desirable; D, desirable; P, partly desirable; U, undesirable. aThe name of scientist who first published the scientific name. Herders were able to identify a total of 87 different plant species, and able to describe their preferences for different types of livestock as well as the trend for a 10-year period (Table 3). Based on the trend over the years, forages were categorised as ‘decreasing’, ‘increasing’ and ‘stable’. The availability of ‘decreasing’, ‘increasing’ and ‘stable’ forage is significantly different in all landscapes (F-tests, all P < 0.05) except in Qaa wachu landscape (P > 0.05). In most landscapes, the proportion of ‘stable’ and ‘increasing’ forage species was relatively more, compared to the ‘decreasing’ and ‘stable’ forages species (Figure 1). The greater proportion of ‘decreasing’ species is preferred by cattle while ‘increasing’ species are preferred by goats and camels (Figure 2). 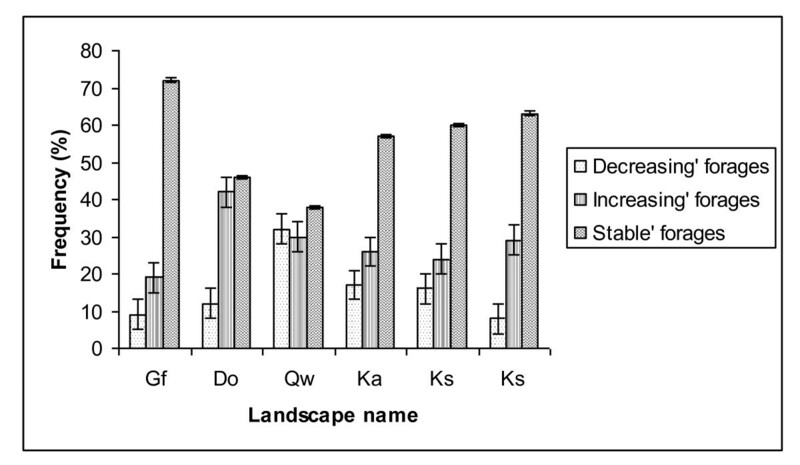 Frequency (%) of ‘decreasing’, ‘increasing’ and ‘stable’ forages in the micro landscapes of Marsabit central area, northern Kenya ( GF = Gar foqolcha, Do = Diid ogono, Qw = Qaa wachu, Ka = Kooticha ammessa, Ks = Kooticha sapansa, Kf = Kooticha fullessa ). 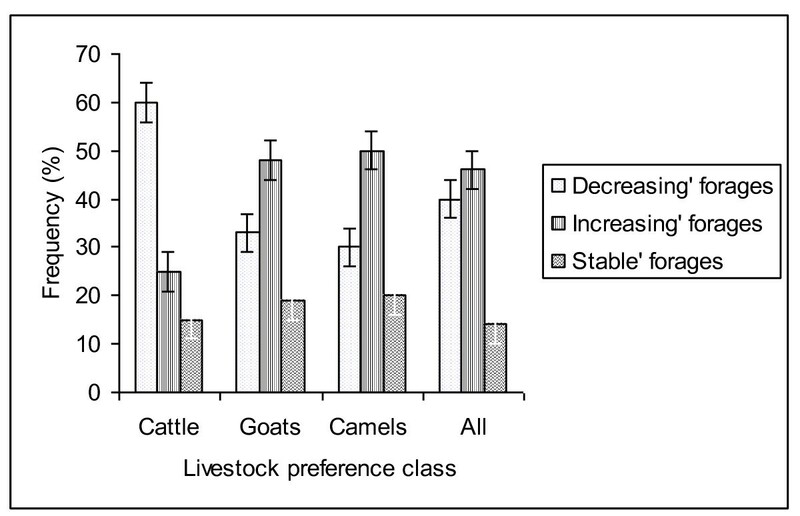 Frequency (%) of ‘decreasing’, ‘increasing’ and ‘stable’ forages against different livestock preference classes in Marsabit central area of northern Kenya. The herders’ concept of rangeland quality was closely related to livestock productivity response. Livestock which graze on landscapes with high quality of forage resources are expected to increase milk production, exhibit good health, high mating frequency and more successful calving or kidding rates. The texture of animal dung and hair condition are also used by the herders to determine the quality of forages on different landscapes. Livestock grazed on good quality landscapes have smooth body hair but when grazed on poor quality landscapes they display rough body hair. Herders believe that livestock instinctively assessed the condition of the rangeland and adjust their behaviour accordingly. The livestock would refuse to graze on landscapes that have poor forage quality. The rangeland quality indicators are gauged from livestock productivity performance observed at landscape level. The quality varied from one landscape to another (Bollig and Schulte 1999; Oba 19851994). Using the livestock-based concept of environmental change, the Borana herders were able to monitor rangeland at landscape level over several years and related the current status to historical socio-economic events. They are able to show deteriorating rangeland condition as indicated by replacement of preferred forages by less preferred forages. Landscapes with more ‘increasing’ forage species with less preference to livestock were assumed to be degraded (Tefera et al. 2007). The rangeland quality trend, however, seems to favour camels and goats husbandry in the study area, due to an increase in the abundance of browse plants, while the grasses needed by cattle are decreasing. A similar trend in the rangeland quality has also been reported in South West Marsabit of Kenya (Lusigi 1984) and Borana region of southern Ethiopia (Gemedo-Dalle et al. 2005). The informants were able to recall landscape vegetation changes from their personal experiences dating back to their childhood. Their historical oral narration captured continuous processes of environmental changes caused by various socio-economic factors, which included settlement, farming, charcoal burning and commercial logging. The knowledge of herders further provided an holistic approach to rangeland assessment and monitoring, where landscape vegetation was related to livestock productivity performance, suggesting that herders’ knowledge is vital in rangeland condition monitoring and assessment ( Allsopp et al.2007; Roba and Oba 2008,2009a; Verlinden and Dayot 2005). From the evidence, it can be deduced that Borana herders’ indigenous knowledge of rangeland quality assessment and monitoring is comparable to those used by other pastoralists in similar environments such as southern Ethiopia (Oba and Kotile 2001), Tanzania (Mapinduzi et al. 2003; Oba and Kaitira 2006), northern Namibia (Sheuyange et al. 2005), north central Namibia (Verlinden and Dayot 2005), Mongolia (Fernandez-Gimenez 2000) and Arial pastoralists of northern Kenya (Roba and Oba 2009b). The indigenous knowledge is not only helpful in understanding the actual rangeland condition, but may also encourage local participation for rangeland rehabilitation activities (Robertson and McGee 2003). In pastoral areas where rangeland quality status has been deteriorating mainly due to combined forces of land use changes and increased livestock grazing, participatory rangeland quality assessment and monitoring with local herders has an important role in assessing rangeland degradation. In this study, Borana herders were able to describe landscape and context-specific qualitative changes in vegetation. The fact that the changes in forage composition have direct effects on livestock productivity performance is an important consideration in rangeland quality assessment and monitoring. The herders’ personal experiences and collective social memory help in understanding rangeland quality trend and causative socio-economic events. The knowledge of Borana herders has thus shown that rangeland quality is a dynamic process of environmental changes which cannot be understood with one-time ecological assessments. Herders’ knowledge can play a complementary role to the conventional ecological research methods of rangeland quality assessment and monitoring, and this knowledge may provide a basis for encouraging local communities in range rehabilitation. aThe system is practiced in southern Ethiopia. In northern Kenya, it is less visible, and only some activities associated with the gada cycles are observed. However, the Borana whether in southern Ethiopia or northern Kenya follow the reign of gada leaders (Aba gada), and this is very useful in recalling events that happened many years ago. The authors acknowledge contributions to the field survey by Diba Guyo of KARI (Kenya Agricultural Research Institute) Marsabit and herders Bante Hallo, Jillo Jattani and Golich Boru. The authors also acknowledge the grant support by the Norwegian Research Council (NFR) under the project “Community Participation in the Implementation of the Global Environmental Conventions” (Project no. 161359/S39). BHD carried out field data collection, data analysis and drafting of manuscript. OG and HGR supervised field work and made comments on the manuscript. All authors read and approved the final manuscript.